With a ghost in the attic, a bogey monster in the basement, and a pixie in the piano, it’s no wonder Jackson is having trouble sleeping. 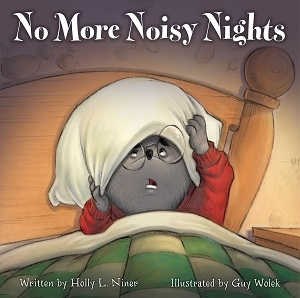 No worries, though—some thoughtful problem solving guarantees a restful slumber for Jackson, and perhaps a few new friends, in No More Noisy Nights, from Holly L. Niner. Amusing illustrations from Guy Wolek reveal an adorably earnest Jackson and his kind but clamorous neighbors as they learn to peacefully coexist.